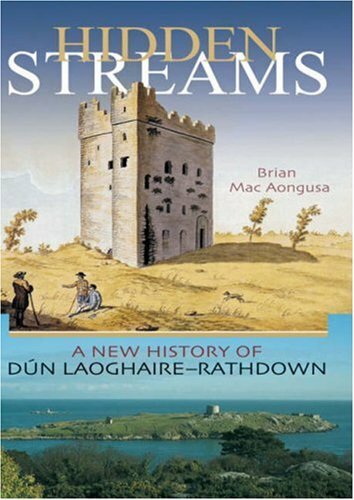 Recently I was given a lend of Brian Mac Aongusa's history of Dún Laoghaire-Rathdown (DLR), "Hidden Streams", published in 2007. Mac Aonghusa links local history with the geography of this part of South Dublin. Though I'm not a native of DLR, I have lived here since 1990. Neither have I any family ties here - I come from south Co Wicklow, my Mum's parents were from Galway and Wexford, while both my Dad's parents were from North Cork. I have no roots in this area, so it was time to find out a little bit more about where I live. "Hidden Streams" is an interesting account of how the streams influence the locations of places such as Dún Laoghaire, Rathfarnham, and Stillorgan. I was particularly fascinated to learn the there actually was a brewery on Brewery Road, where the Glaslower flowed. A pity a lot of locations like mills and breweries are long gone, but nevertheless the history is fascinating. A few more larger scale maps, with perhaps modern roads overlaid, would have added a bit more value - some areas mentioned I did not know where they are. While the history and geography of the region is fascinating, there are not many central characters who had an serious impact on the development of the county. Surprising also that the likes of Frascati House and the Fitzgeralds were not mentioned, but this is part of Blackrock history, and not of "Hidden Streams". Overall - an interesting read for anyone interested in the history of south Co Dublin.